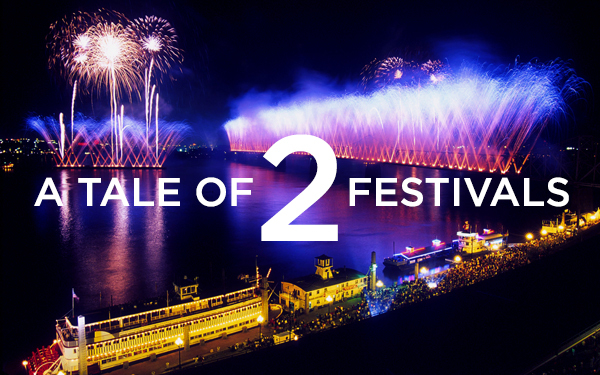 In my time at Current360 I’ve had the pleasure of working on two festivals. Both were produced on a large scale and encompassed numerous events over a period of time. And like with any event, both had one million moving parts that needed to be well managed and handled with care. However, there was one glaring difference between the two: one festival had been around since 1956 and the other was taking its maiden voyage. I was fresh-faced out of college when I began working on the Kentucky Derby Festival account. I won’t lie, the bright lights of an event this scale excited me. I loved every second of it! I immediately jumped in during the middle of planning—since the planning had already been going on for months—and forged ahead. The Kentucky Derby Festival has been around so long, they had the planning down to a science. I think they could run the events and garner sponsorships in their sleep! Though the events may be slightly tweaked from year to year, for the most part they stayed the same. The maiden voyage of this event occurred this October 14-19 at Waterfront Park. Five historic riverboats were in town to help the Belle of Louisville celebrate her 100th birthday. And for six days, visitors could enjoy riverboat cruises or land events. Being that it was a smaller event, we faced a few challenges like fundraising and government budget cuts. Despite these challenges, we had a great team that persevered and made the festival happen! Though it’s hard to garner an audience months in advance and get sponsors onboard when there’s no history of past ROI, it was a huge success! Through media and sales team efforts, more than 30,000 tickets were sold and 45 states and eight countries were represented at the festival. The Kentucky Derby Festival events take place over the course of 5 months instead of 6 days like the Centennial Festival of Riverboats. I think this enables marketing messages to focus on specific events versus an all-encompassing message. Having a larger sponsorship base and budget can go a long way in producing and promoting an event. Trade agreements with local media stations also plays a large role in getting the messages to your target audience. Having an idea of the budget from year to year can help seasoned veterans know what to save and what to splurge on throughout a festival. Every event—no matter how many times you do it—will have pitfalls and setbacks. The more experience you have planning a particular event, the more you may be able to prevent these instances. No doubt, there’s plenty of stress and frustration that can come with planning any event. Remember to have your end goal in mind and work towards that. There may be hiccups along the way but just think “This is a plot twist” and keep moving forward! I hope these tips can help you with your next event. If you’re looking for complete event marketing services, give us a call.